Aye, but 15% of the population there speak it fluently if not as their first language. That's much higher than in either part of Ireland surely? If I'm the defendant and you're witness for the prosecution (or whatever), I'd want to be reassured on two broad grounds. First, that waiting for translators etc. doesn't extend a stressful process and second, that if the case needed specialist knowledge or skills, it would be extended further. Which returns us to the basic costs point. 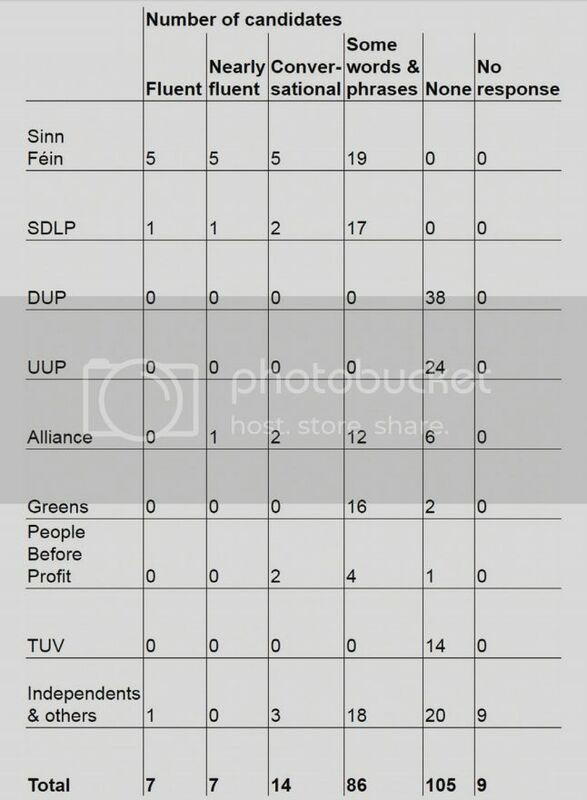 Assuming DUP 'win' but Foster loses her job, they have plenty of other salaried hacks so a new leader with different/ better skils should emerge. Can't see JA happening with us leaving the EU, but then the current Brit govt is so bat**** crazy I suppose anything's possible. Thanks for that Ervine link, should be interesting. I believe it is considerably higher, but hasn't that level of fluency in Wales been assisted by Welsh language legislation? This is an edited version of the text of an article An lahhrann tú Gaeilge? by Jim Stothers, Deputy Clerk of the General Assembly, that appeared in the Presbyterian Herald October 2015. It is often thought that Presbyterians neglected to evangelise Ireland, and they shunned the Irish language. Jim Stothers looks back at history to refute this assumption. In 1836 the Church of Scotland received the Presbyterian Synod of Ulster into its communion. A leading minister from the Synod addressed the Assembly in celebration and, in a speech sprinkled with Irish words and phrases, shared a key aim of the Synod: to share the gospel with those who “speak exclusively or generally in the native Irish tongue”. Cooke’s possession of an ability to read and speak the language of several Irish books, including a Bible, probably the Psalter (1836) and Shorter Catechism (1837); his desire to evangelise in Irish, and to require students for the ministry to attend Irish classes was typical of many. The Irish schools he mentions were located from the Glens of Antrim through Tyrone to Kerry and taught Irish speakers of all ages to read and write their own language with the Bible as the textbook. Meeting in houses and barns, they peaked in the 1840s at 300 with 16,000 enrolled. Our link with Irish goes back much further. At the Plantation speakers of Scots Gaelic (pronounced ‘Gallic’) and Ulster Irish easily understood each other. A proportion of the settlers spoke Gaelic - and not just those from the Highlands. They came to the most Irish part of Ireland and shared the gospel with their neighbours. The session minutes of Templepatrick from 1646-96 yield such native Irish surnames as O’Quin, O’Donnelly, O’Connally and O’Mony, while in 1647 ‘bonds of marriage’ were given for a couple called Shan O’Hagan and Shillie O’donally [sic]. In 1647, only five years after Presbyterianism was first organised in Ireland, the first native speaker was ordained as a minister - Jeremiah O’Quin in Billy, Bushmills. He became the first Presbyterian missionary in the Irish language, going to Connacht in 1654. The beginning of the next century saw a deepening in commitment to evangelism in Irish, with 12 ministers identified as being able to preach, not just speak, in Irish. Presbyterian worship was regularly taking place in Irish as it - or Scots Gaelic - was still the native language of some. In Ballybay the service one week was in English, the next in Irish. Other places with Irish preaching included Markethill, Aghadowey, Dundalk and Cushendall. There may have been more for it wasn’t something to be remarked on. Through the 18th century Irish died out among Presbyterians, lingering until 1818 at Ballymascanlon, Dundalk, where there was a settlement of Highlanders. So if you thought that the Irish language was something foreign or alien to Presbyterians through their history, or that it was only of interest to the liberal merchant classes of Belfast around the turn of the 19th century think again! It certainly was of interest to them and they collected and preserved ancient Irish manuscripts; ran Irish language classes in places as varied as Pottinger’s Entry and Royal Belfast Academical Institution; and organised a harp festival, where the music of the last of the old Gaelic harpers was noted down. Can we reclaim the Irish language as part of our heritage back from those to whom we have surrendered it? Rev. William Neilson grew up as a son of the manse in Kilmore, Co. Down, and in 1808 produced An Introduction to the Irish Language based on Co. Down Irish. This was also the time of the United Irishmen. It’s not surprising that there was an interest in the Irish language among them, but the fact that revolution and the Irish language weren’t inextricably linked is proved by the continued, if not intensified interest in the language in Belfast well into the 19th century. If you thought that our Presbyterian ancestors developed a Church that was only for the colonists then you will be surprised again! From Jeremiah O’Quin right up to the 1850s - when the Great Famine changed Ireland utterly and the number of Irish speakers plummeted - the work done, and the resources put in to communicate the gospel to Irish speakers demonstrates that Presbyterians had a genuine desire to reach out with the good news of Christ to others who had no access to it. Remember, the Bible was a forbidden book to the majority. After the famine the work continued but in a different form - English was taught instead and young people were given basic skills that would help them to find employment. Irish continues to be used on a small scale in the life of our Church. Some congregations’ noticeboards proclaim them to be part of Eaglais Phreispitireach in eirinn (The Presbyterian Church in Ireland); a small number of our ministers speak and can preach in it; and a group meets monthly under Presbyterian auspices to study Scripture and worship in Irish - appropriately, it’s called An Tor ar Lasadh (The Burning Bush). Can we reclaim the Irish language as part of our heritage back from those to whom we have surrendered it to be used for their own ends? Can we regain the zeal with which our ancestors reached out to those who did not know Christ whatever language they spoke? I find myself approving the sentiment of those who advertised Irish classes in Belfast in 1795: ‘By our understanding and speaking it we could the more easily and effectually communicate our sentiments and instructions to all our Country-men; and thus mutually improve and conciliate each other’s affections’. Irish was the vehicle for that then - I ask myself what is the equivalent vehicle today? Originally Posted by Ian Malcolm / Q.U.B. much ours, as much a part of our identity, as it is of somebody of a different religion. Indeed. Although the Southern example suggests legislation's hardly a panacea? Indeed, but if it is done right and there is a will, the chance of achievement is much greater. I find it astounding that no UUP, DUP or TUV candidate is prepared to admit to even having just "some words and phrases" of Irish. At least a few of them must surely have a cúpla focal, but is there such a taboo over it or stigma attached to it within mainstream unionism, that they'd be fearful of saying it? Ha ha. It sure seems that way, they are clearly lying. They all know GRMA and TAL for a start. I'm impressed that 28 candidates have at least conversational skills. In Irish I mean, some of the DUP hillbillies don't have them in English. At least 250,000 of the Scotch Irish emigrated to the Americas in the 18C, with a lot of them eventually settling in the Overhill and Overmountain region of the Appalachians, where many became known as Hill Billys. The term hillbillie could even have a Scot dialect origin, I don't think gaels would want to contest that claim. The Unionist academic/broadcaster, Dr Ian Malcolm is also an interesting read in relation to Protestantism and the Irish language. Last edited by culloty82; 21/02/2017 at 6:18 PM. I quoted and linked some of his words above culloty. He should be required reading for the DUP presently as the fumble and stumble to enlightenment. Party leaders Nesbitt and Agnew were interviewed by Crawley and Nolan respectively, touching on the Irish Language. Mike said his opposition to an Act was because Michelle wouldn't tell him what should be in it, although he did laughingly admit to knowing what TAL, GRMA and er SF mean (to be fair, his 'few words and phrases' probably extend little further than those three, while anyone who learned at primary school likely has two or three hundred at the back of their mind). All this is a red herring, as any election in the North will not be decided on parties policies towards the Irish (or any) language, but in their management of the economy and related social structure. The Alliance have become embroiled in a "mini-controversy", after admitting to lining up fake callers for BBC Ulster's version of Liveline. None of which will be news to Southerners, given the grand tradition of planting audience members in RTE current affairs shows. It would be naive for anyone to think Alliance are the only party up to "false flag" tricks like that. The difference with Alliance is that they got caught. All this is a red herring, as any election in the North will...be decided on...management of the economy and related social structure. The Alliance have become embroiled in a "mini-controversy"
Long's occasionally salty language (including in public) is no secret. Her directing it against two councillors resigning in a huff isn't much of a story. Last edited by Gather round; 22/02/2017 at 12:09 PM. Even the BT Facebook page is more incisive FFS.